There’s not a whole lot to say about prepping onions for storage, except that the goal is to dry them sufficiently before placing them in storage. We have a table on a porch where we gather some small amounts of vegetables as they are harvested. A spot in a garage or even the shade of a tree would work as well, as long as the food items are protected from getting rained on. We lay out a few pieces of newspaper to make the clean up go a little faster. The newspaper will catch dirt and shed pieces of the outer wrapping of the onions. Use a thumb and fingers to remove clumps of dirt and long roots as well as wet outer layers of the onion skins. Onions are laid on their sides on newspaper to dry before storage. 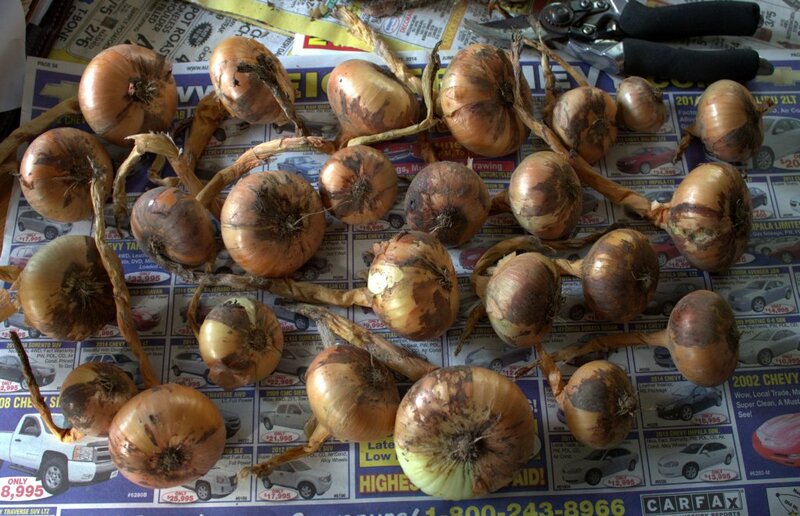 Lay the onions out on the newspaper so that the bulbs are on their sides and the root section is exposed to the air. We want the onion to dry out well before cleaning off all the dirt and outer layers of the bulb. Make sure the onions are not touching each other and that they have some room for air circulation for the best drying. Pick an area where the onions can be laid out to dry for a couple of weeks. When harvesting the onions on a sunny day, this drying time might be reduced as the onions will dry nicely in the sun. However, the tops may still feel “green” for a few weeks. Use any of the damaged onions in the kitchen first and also use first the ones that retain the least outer skins as they won’t store as well as those onions that are completely wrapped by their own skins. Harvesting onions is easy work. Watch them grow and water them until the tops fall over. 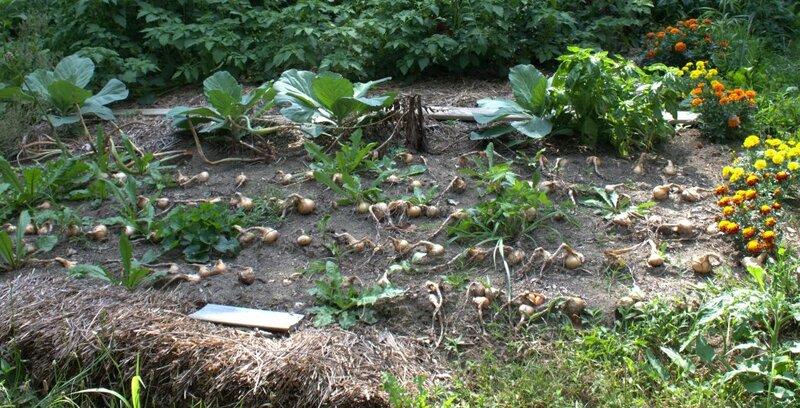 When the green tops have faded to brown and the onions appear to be drying out to a tan color, it’s time to harvest. This year the onion harvest is early for us. Usually we’ll be harvesting them in September or even October, not August. We have to harvest when they’re ready however, or else they could rot in the garden. The torrential rains we’ve had must have toppled over their greens early. Now that the green tails have all but dried up and withered down to a small portion, we’re removing the onions from the garden. Onions are ready to harvest as noted by their brown and withered tops. Once the onions are lifted from the ground, and it’s really that easy, they’ll be set on newspaper to dry. Roots can be snipped off with your fingers and the outer dirty wrapping removed also. Don’t clean the onion bulbs too good at this point. The outer wrappers will protect the juicy onions from drying out during storage. Wait for a week or two and test whether the top near the onion itself feels moist. If the top feels like it isn’t totally dry, wait. Wait to cut off the brown tops until they’re completely dry.